GRAFENWOEHR, Germany — The Young Lives, BIG Stories contest gives kids from age 3 through grade 12 the opportunity to share the ups and downs of military family life in words and art. The contest is part of the annual Month of the Military Child celebration, which is hosted Army-wide each year in April. This year, U.S. Army Garrison Bavaria celebrates the achievement of a winning participant in the 2018 Young Lives, BIG Stories contest. Unlike other children, military kids are confronted with frequent moves, new schools and deployed parents. In 1986, the Month of the Military Child was instituted by the Department of Defense, with the aim to honor the hardship and challenges these young lives endure. Ann Margaret’s drawing pictures a face with a sad side and a happy side. 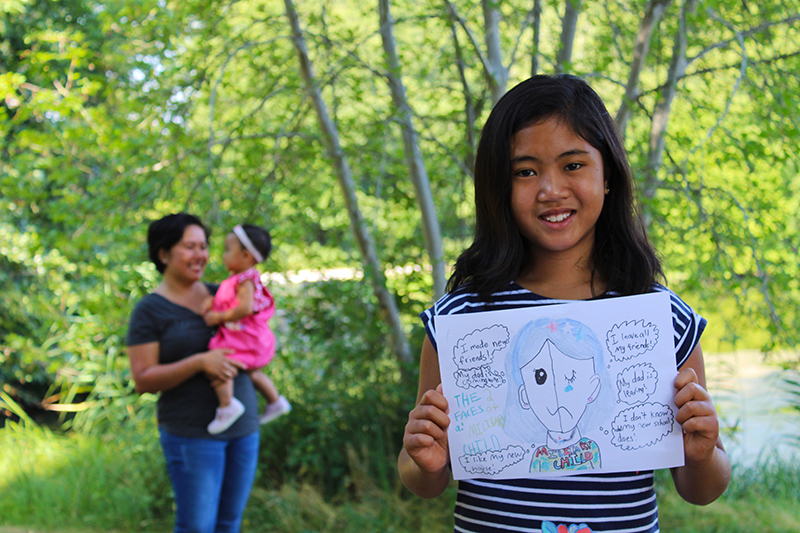 Her artwork describes her emotions and experiences since becoming an Army child. Her father, who is currently stationed in Vilseck as a medic, used to be a teacher before enlisting in the U.S. Army. Since then, Ann Margaret, her little sister and parents moved once before calling Vilseck their new home. Born and raised in Chicago, Ann Margaret is excited to be in Germany and looks forward to her grandparents visiting. Congratulations to Ann Margaret and all children who participated in the contest. Seven winners in all were selected from the following installations: Fort Campbell (two winners), Army National Guard (two winners), Fort Huachuca, USAG Wiesbaden and USAG Bavaria. For more information on the 2019 contest, visit army.mwr.com.